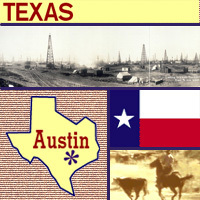 ﻿ Fun Easy English - Travel the United States of America - Texas. Learn before you travel. This section of Fun Easy English focuses on facts and other cool stuff about your favorite U.S. state. This is great English reading practice. 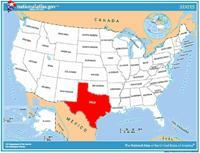 This page focuses on the state of Texas. The Texas state flag is the 1839 National flag of the Republic of Texas, which features the famous Lone Star (also seen on the Texas state seal and the U.S. mint's commemorative quarter for Texas). The red, white, and blue of the state flag of Texas represent bravery, purity and loyalty. Six different national flags have flown over Texas representing the countries which have ruled it (France, Spain, Mexico, the Republic of Texas, the Confederate States of America, and the United States of America). Texans proudly wave all six official flags for public displays and expositions. A rarely-mentioned seventh flag flew over the new Republic of Texas for three years, beginning in 1836. The flag had a blue field with a single gold star in the center, fashioned after the flag of the short-lived Republic of West Florida. That flag symbolized independence and was later used by the Confederate States of America as the "Bonnie Blue Flag;" the lone star remains on the official Texas flag of today (the gold star now white). Origin of Name Based on a word used by Caddo Indians meaning "friends"
Travel and tourism site for Texas - This state travel and territorial tourism site provides ideas for your vacations, meetings, and more. The people wearing those beautiful costumes in the photo are doing a type of dance that has been done for more than a century. The dancers are part of "Los Matachines de la Santa Cruz," a traditional Mexican dance group that is active in Laredo, Texas. Many of the dancers are actually descendants of former dancers who are continuing this old tradition, which has existed for more than 100 years. The group specializes in a type of religious dance-drama called matachine that honors the Holy Cross and the Virgin Mary -- important symbols for Catholics and other faiths. The dance begins by removing the cross from its normal resting spot in a chapel and placing it on a wheeled pedestal outdoors. A drum and an accordion start to play. Dancers wearing brightly decorated velvet skirts perform in front of the cross. They carry carrizos, six-inch sections of bamboo that make a unique musical sound as they dance. The dance is part of a traditional fiesta that includes feasting, prayer and displays of textiles and folk literary arts. The people of east Texas love a good fiddle tune. That's why so many of them gather every year for this event. The reunion is a chance for fiddling friends to catch up with each other, and the contest is a chance for fiddlers to show their stuff. Contestants range in age from 11 to well over 65. They are judged on their style and skill, and, most important, on how closely they re-create old-time fiddle music -- the music that gave courage to starving troops of soldiers at Valley Forge during the American Revolution, earned devoted admirers like Benjamin Franklin and Thomas Jefferson, and today continues to delight millions. You might not think that an 88-year-old woman could handle a 70-mile trail ride, but that's exactly what Atha Marks Dimon did in 1999 during the Salt Grass Trail Ride in Texas. By going on the ride Atha was following in her father's footsteps many years earlier. In the 19th century, pioneer cattlemen herded their cattle to Houston up from the salt grass pastures on the Gulf Coast of Texas, where their cattle had been grazing and fattening up. Times change, and since 1900, cattlemen have not needed to herd their cattle across the open land; instead they use trains. In 1952, four old-time cowmen decided to stage a re-enactment and joined a group of people on the first Salt Grass Trail Ride. One of those four cowmen was E.H. Marks. In 1999, Marks's daughter, Atha Marks Dimon (at the age of 88), her daughter Athene, her grandson Boyd Vaughan, and great-grandson Reagan Vaughan, rode the Salt Grass Trail -- 70 miles from Brenham to Houston -- in memory of the original cattlemen. The people that have gone on the trail ride include bankers, fire fighters, even middle school students. The trail ride has caught on, and now more than 6,000 riders participate. The following is a description of national forests, parks, and monuments in the state of Texas. If you plan to visit or live in Texas for awhile then you should definitely plan to visit some of these fantastic places. Primarily longleaf, loblolly, and shortleaf pine, the forest includes two wilderness areas and borders the Sam Rayburn Reservoir. The forest provides habitat for the endangered red-cockaded woodpecker and wintering habitat for bald eagles. Located where the southeastern pine forests meet the blackland prairies of central Texas, Davy Crockett National Forest's Big Slough Wilderness consists primarily hardwood forest. A recreation area surrounds Ratcliff Lake, which covers 45 acres (18 ha). Sabine National Forest borders the western side of Toledo Bend Reservoir and has 28 mi (45 km) of trails. The forest's only wilderness area is the Indian Mounds Wilderness. Old-growth forest can be found in the wilderness and at Mill Creek Cove along the reservoir's shores. Part of the Lone Star Trail travels through Sam Houston National Forest, which borders parts of Lake Conroe and Lake Livingston. The Little Lake Creek Wilderness is the only wilderness area in the forest. Named for the prominent bend in the Rio Grande along the U.S.–Mexico border, this park encompasses a large and remote part of the Chihuahuan Desert. 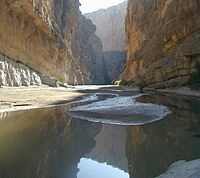 Its main attraction is backcountry recreation in the arid Chisos Mountains and in canyons along the river. 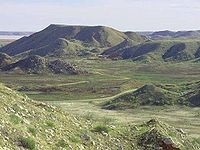 A wide variety of Cretaceous and Tertiary fossils as well as cultural artifacts of Native Americans also exist within its borders. This park contains Guadalupe Peak, the highest point in Texas, as well as the scenic McKittrick Canyon filled with bigtooth maples, a corner of the arid Chihuahuan Desert, and a fossilized coral reef from the Permian era. Alibates was the quarry site for high-quality, rainbow-hued flint that was distributed throughout the Great Plains in pre-Columbian times. It is jointly operated with the Lake Meredith National Recreation Area and includes the ruins of several Plains Village Indian dwellings. The Waco Mammoth National Monument is a paleontological site and museum in Waco, Texas, United States where fossils of twenty-four Columbian mammoths (Mammuthus columbi) and other mammals from the Pleistocene Epoch have been uncovered. The site is the largest known concentration of a single herd of mammoths dying from the same event, which is believed to have been a flash flood. A local partnership developed around the site after the initial bone was discovered. This video is all about Big Bend National Park. This video is all about Guadalupe Mountains National Park.